Flies are attracted by food and garbage. Few things can ruin your perfectly-planned wedding day faster than a swarm of flies buzzing around your guests. Several types of flies, such as house flies, black flies and horse flies, can be found outdoors. Since most types come out during warm weather, a June wedding can be just as much of a party for them as it is for your guests. Keeping these critters away from your wedding isn’t just a matter of appearance; flies also carry diseases like dysentery and typhoid fever. Inspect the area several days before the wedding. Look for areas where clusters of flies are gathered. Flies are probably breeding in these spots. Hire a pest control company to spray the areas with insecticides. Set up several fly traps in areas at least 100 feet away from the wedding location. These traps will attract the flies, keeping them away from your guests. Choose areas away from pathways or any other location where guests will be. 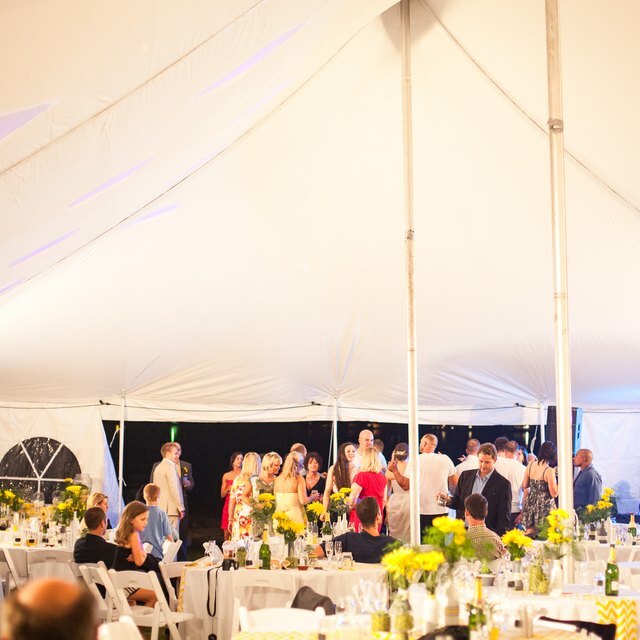 Move large trash cans or dumpsters at least 100 feet from the edges of the wedding site. Flies often swarm around trash, especially when the weather is hot. Hire a waiter or busboy to clear trash from tables. Ask this person to constantly circulate throughout the reception, placing guests' trash in bags. Instruct him to take each bag to the dumpster as soon as it's full. Use centerpieces that don't include plant life. Wet soil attracts flies. Use silk flowers, candles or vases filled with sand and pebbles. Serve drinks in covered containers. Pour iced tea and lemonade into large, covered jars or urns with spigots so flies can't get into the liquid. Ask bartenders to keep wine bottles corked between servings. Keep food covered for the entire reception. Buy wire or glasses domes to place over platters of cookies or appetizers. If you're serving a buffet-style meat, cover the chafing dishes as soon as all the guests have served themselves. Station a waiter there to reopen the dishes whenever guests want second helpings. If you're not getting married on your own property, talk to the location managers about how to deal with flies. If there are flies breeding or swarming on their property, they might be willing to treat the area before the wedding. You must also get permission before you apply any fly-fighting chemicals on their property. Don't spray insecticides yourself. These sprays can be harmful if not used properly. Insecticides can be dangerous for pets, so keep animals away from any areas that have been sprayed. The pest control technician can tell you how long to keep your pets away from these areas. Cornell University: New York State Integrated Pest Management Program: What's Bugging You?